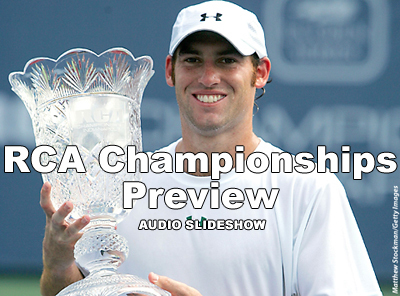 The 2006 RCA Championships, held in Indianapolis, Indiana, feature some of the best players on the men's tour. From July 17 through 23, top-ranked American James Blake, defending RCA champion Robby Ginepri, 2005 US Open Series overall winner Andy Roddick, and two-time Grand Slam champion Marat Safin will battle for valuable US Open Series Lever 2000 Challenge points. The winner receives 50 points, the runner-up, 35 points, the semifinalists, 22 points, and quarterfinalists, 15 points. Click on the image below to listen to the RCA Championships Audio Slideshow Preview.